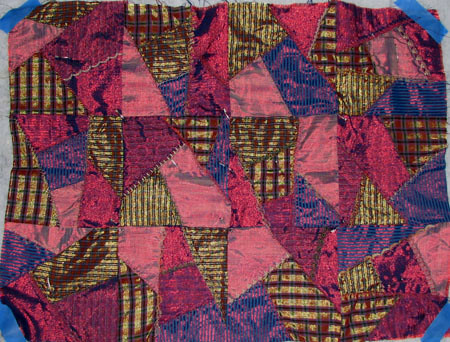 The final quilt of my Labor Day weekend not-quilting spree was this mock crazy quilt. This quilt top was already fully assembled when I found it in my craft room, and just needed to be basted. It’s a small quilt, only 19″ x 26″, and it won’t have a border. If you look closely, there are only two different block layouts. Both of them are mock crazy quilt blocks, and I wanted to see if it would work with some scrap fabrics before I tried it out with better fabric. This entry was posted on September 9, 2010 at 7:31 pm and is filed under quilt, UFOs. You can follow any responses to this entry through the RSS 2.0 feed. You can leave a response, or trackback from your own site.